The contents of this blog were originally included in a Geocities site in 2001and have been since then the platform for a series of discussions about design, temporary architecture and were the genesis of a unique approach to a versatile and adaptable generation of buildings. These ideas were developed by Mauricio Rodriguez Anza during 1992 to 1998 and were the focus of a number of articles published in diverse design and architecture books and magazines. The purpose of this site is to make those articles available again for architects, designers and readers in general. This compilation of texts –relevant by their intellectual input at the time—represent the beginning of a new debate about design in Mexico City where Rodriguez Anza’s work in design was the center of exhibitions in galleries and museums, building a new bridge for the arts in Mexico. Later they focused on applying most of those formal and intellectual principles to a diversity of mid-size architectural installations proposing new building typologies. As a result of this, art and architecture critics would get involved in the discussion, developing a new written language for design. Such was the case of Jose Manuel Springer, Luis Carlos Emerich and Jorge Reynoso Pohlenz. The original name of this compilation of texts was: “The Uses of Meaning; Writings on the work by Mauricio Rodriguez Anza”. This blog will eventually include additional texts and analysis in relation to these articles. by Luis Carlos Emerich. 1993. In a distinct break from his generation, Mauricio Rodríguez Anza began his artistic career with a formal education in architecture. But, he has united the diverse spirits of his practical origins and moved away from creating an “artificial” environment for man. He may well have been seduced by pluralist and interdisciplinary tendencies which climaxed in the 80s with the trans-vanguard, postmodernism, neoconceptualism and the resurgence of other lost philosophies. Maybe he was artistically inspired by an array of marvelous new materials that stimulated his imagination, like a sculptor inspired by new, sophisticated clay. But, perhaps more than anything, the turbulence of the times (and its styles) motivated him to create sensual answers to new compositional problems. Perhaps more than purity, he was striving toward a man-object-environment unity through the limitless hybridization of architecture, painting, sculpture, stagecraft and choreography which –in abstract terms– has dominated modern design and which, on account of its new pluralist style, has rejected the notion of the “decorative” as superficial. To the original idea of creating an environment for man through architecture, Rodríguez Anza has brought a new spirituality which is paired with a visual abstraction. He distills function into another esthetic game, including the mysterious exploration of interior and exterior living space. Here, physical proportions can become poetic metaphors and furniture is more than a treasured domestic object. His work surpasses the pleasure of mere craft to produce an art which now has earned its place in history: when refined and formally inventive, design constitutes its own distinct art form. However one may choose to define postmodernism –that artificial concept used to redefine the circular nature of time (and thought) — the fact is that today the past is returning, but its latency is not the same. It is not nostalgia. It is a current that runs through periods and styles in which one senses new possibilities for reconciling philosophies entrenched in art, revitalizing its original, idiosyncratic sense through the present need to rise above the nihilistic trend that has led to an exacerbated materialism. Now that spirit seems to be an incongruence bordering on the absurd, it requires historical justification with regard to its currency during the pre-industrial era. Oddly enough, however, industry makes its reinstatement possible, for it has produced the means of “ensambler” combining forms from various artistic periods and creating a random sense of time, as in dreams. Culturally diverse symbols are brought together logically in a work whose interpretation may hold the key to its own existence. All of this serves to emphasize the times in which Rodríguez Anza lives and the form that makes the use of space and objects meaningful. To say that this is not vanguard (or better yet anti-vanguard) may be a blatant contradiction. This raises the question of an esthetic antithesis whereby everything new or “revolutionary” from the former avant-guard may well be nothing more than an abject prolongation of the vanguard itself–before its fall. The adjective used to describe this international trend serves to mark a historical moment in which we are reevaluating a vacant humanism. For example, today’s use of Art-Deco–cold, technological, futuristic and seemingly inhuman–can now be seen to have successfully established a symmetry between man and his environment. Not the symmetry between the body and its functional needs, but that of man and his aspirations: a dimension lost among the minimized paraphernalia of modernity. This includes the perspective of functionalism whereby a house was considered a machine, implying that man is a productive entity with that of having enough air to breathe inside his home, while longing for this hope to be communal, something akin to a public space. True eclecticism is not the result of nostalgia. It is the immediate result of what in other periods occurred involuntarily, such as the various styles used during the extended time it took to build, for example, certain cathedrals or public buildings. It is not a five-and-dime-store dose of a bit of everything, but the union of congruent philosophies, an expression of the diversity of man himself. In this way, the concept of a postmodern work–like those of Rodríguez Anza, if you will–has the ability to “remember” without in fact being a memory itself. The artist introduces memory into objects. If things of the past were golden, they are present in today’s work, but the result is entirely different. Just as photography opens our eyes, the work of Rodríguez Anza gives meaning to that which once eluded our view. Therefore, what might seem a harmonious sum of stylistic clichés–whose total ultimately differs from the sum of its parts–may well serve as a gauge to further understanding. This is hardly plagiarism. Instead, it is a re-reading of “eternal” creative motifs used for a particular end: the personal interpretation of symbols. For example, a chair designed by Rodríguez Anza is not just an object for physical comfort. It is a translation of the object to the user’s expectations, an investment that in theory is “armed” with the most important currents of thought manifested over several centuries. It is simple and “proud,” an object whose worth does not depend on the consumer’s buying power, but on its own cultural value. Objects and furniture become the combination of sensibility, taste and personal style and they create a prolonged emotional effect, like a grandmother’s armchair you can no longer find at an antique shop. 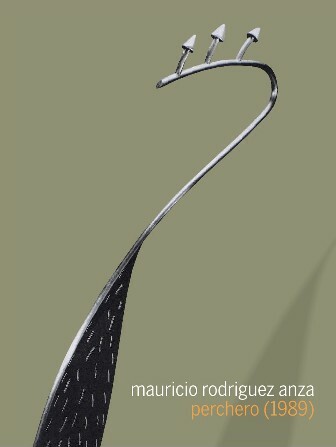 Rodríguez Anza has returned to the use of materials with the same dignity as “before”. But, the emotional content of his work is different. Like a time-honored artisan working with mahogany, he uses stainless steel with a patient and laboring touch. He turns a credenza, trunk or a dining room table into a permanent symbol of family life. And while the structure of the table is reduced to a minimum, its nobility remains intact. Now, it no longer features the “institutional” weight of his former work, but rather a lightness of spirit. The legs to certain works proliferate and have such theoretical strength that they could sustain an entire house or the veritable temple of the dining room itself. Rodríguez Anza creates a piece of furniture that emanates with the essential: while satisfying a human necessity, the work exalts its own ability of gathering people together to eat or to take part in the ritual of food. This is equally apparent in a carving table, a pedestal, a bookcase or a dresser by Rodríguez Anza. These pieces immediately lose their practical function: they become abstraction. And like antique furniture whose original use becomes distilled over the years, Rodríguez Anza creates furniture that simply “exists”. While other pieces may satisfy practical needs –closets, cupboards, etc. — Rodríguez Anza’s works do everything else. What matters is the dignity of each piece: its memory. Working with objects –man’s physical gauge and the true standard as to the chosen space and the cultural status of the user– Rodríguez Anza has returned with maturity to his early years in architecture. Now his work with “everything else” is reflected in walls, roofs, columns, windows, doors: all of which project an idea consolidated in his furniture design. Whether this means re-designing an old house to be revived with a new spirit, or modifying spaces which were conceived as mere cubes to confine all aspiration, the architect has found a way to systematize the philosophy inherent in his furniture. Man lives in what might be called “theoretical real estate.” Construction, therefore, should follow the broadest and most transient concepts to produce dynamic living spaces. A house created by Rodríguez Anza is a sensual relation of space, marked by a subtle formal or textural treatment and the sparse use of color. Only occasionally are planes of reference accented. Visual counterpoise, for example, may serve to balance the presence of a stairway –a steep and playful path: a passageway– with the stability and weighty proportions of a massive wall. Living room, kitchen or dining room furniture can be moved, but the space it occupies cannot. Instead of tearing down a wall, it is far better to change its significance, its presence. The same space can be made larger or smaller by altering its emotional state at will. If a house is a delicate and spirited organism, how does one approach an office with all of its connotations as to power, character, prestige, work and function? In response to this question Rodríguez Anza has returned to design. With the help of a computer he has created models that combine the feelings of “homelike, active furniture” with the monumental dignity required by today’s businesses. In this world of free market interest and public domain, the best “images” must be sustained. This works by Rodríguez Anza would be the headquarters, for they are a monument to reliability and stability, enormous beautiful objects, something not unlike the common property of the consumer, an unalterable net worth. As a building designer, Rodríguez Anza is an artist who has learned the sober aspects of geometric minimalism. In the lucid use of industrial materials he has derived the way to combine elements. From the human need to project personal experiences and share them, he has recognized the esthetics concerned with the artifact, with the visually-pleasing object and with a theoretically habitable sculpture wherein a dialogue is established, a reciprocal use, a sort of communion that makes esthetics an intensive way of life. All of this contributes to the ultimate objective in the work of Rodríguez Anza: in short, a total experience. Translated by Susana Briante and Roberto Tejada. DECEMBER 8, 1994 . FINE ARTS BUILDING AUDITORIUM, UNIVERSITY OF ALBERTA . For most people architecture in Mexico starts with the origins of civilization such as the Toltecs and the Mayans. But when did contemporary design start in this country? It’s hard to answer the question, however by looking at the exhibition of Mauricio Rodríguez Anza, one may be able to glance at the career that launches on experiment, eclecticism and personal taste. The keyword that fuses all three concepts is Design. The software needed to run a mind’s design program is called ideas. Ideas have different shapes, they carry distinct meaning. They involve responsibility and a code of ethics. In the course of his work, Mauricio has found problems demanding a solution. Sometimes these problems arose in the mind of the designer creating a personal challenge. Mauricio works alone in a time when corporate designer offices have taken hold of most of the market. His ideas come from a desire to confront his personal experience to a new task. One can follow a method to develop new ideas but it is ethically unacceptable to follow an idea to develop a method. This is the trademark of Mauricio’s modus operandi. The offset of this method is marked by the question Why design? The answer is to bring a day-to-day idea into tangible form. A chair, for example, is a day-to-day idea. His approach to ideas leads more to the creation of a language than production of mere specific objects. The difference between one chair and the other, creates a space for meaning not available in one chair for itself. The repetition of the same idea with different shapes resembles the differences in users, it brings human diversity into the context of design. Language is a tool, a tool that transmits information. Every language contains hidden aspects available only through the use of experimentation. The designer therefore is set out to discover those hidden aspects behind a day-to-day idea. The discovery of these will turn the language into something more organic, meaning that the same language develops in unpredictable directions used to communicate a different idea every time, perhaps a new one. This is how Mauricio Rodríguez Anza understands eclecticism. The designer works with materials and information. The outcome is a matrix that allows continuous transformation. This brings options to the users, and allows to personalize the individuals who will use an artifact. Design is not objective, it is not directed to objects but to people. The object must convey a meaning of its own and of the circumstances that saw its birth. Deprived from these, the process to create the objects becomes absurd. When an object is presented to an audience of possible users, the designer should be able to present the problem honestly, facing the possible misuses and limitations the solution offers. This is an attitude of responsibility toward the user and the work. The designer cannot pretend to be original and speculative all the time. The design must be faced with its day-to-day function, and here is where ethical issues become involved in the work. Some of the objects you will see here, along with the photographs of designs made for buildings, can be explained in terms of context. In the case of the objects, these were made having in mind their conditioning of space, suggesting a use, and expressing the designer’s attitude. The console shown here, belongs to a category of objects that were designed preceding the existence of a particular space for them. This piece of furniture can grow systematically by adding extensions that enclose an interaction between basic shapes such as the cylinder and the rectangle. Plane and line. Usually designs for specific interior spaces or facades are subjected to function and to a certain degree they are dependent on the space and landscape. However, in this case Mauricio applies the opposite principle by introducing shapes behaving as independently as possible from the architecture and function. This principle known to architects as a postmodern gesture, has been in the Mesoamerican architecture for centuries. As an example of this, I would like to point out the case of the ever present cylindrical columns in Mauricio’s work. They do not respond to architectural function, instead they are used as motifs that break with the square ends of a building or a room. They modulate the architecture, in the same way that the architecture encases an atmosphere or establishes a dialogue with its surroundings. Mauricio’s look at ancient architecture has led him to become conscious of the cult to light, color, and soberness. In a professional field where architects are more often that not hired to follow the tastes of their patrons, its very easy to fall into the trap of more money makes better design. In his case, the designer has managed to avoid this kind of manipulation by rendering simple principles that allow for perfection and care of the details more than concentrating in unnecessary splendor. The relations between light, form and color, conditions the method follow by him to arrive to a solution. These main concerns repeated over and over in his works have led to a style that can be applied to a variety of conditions of space and materials always reflecting his approach to design’s causes and consequences. 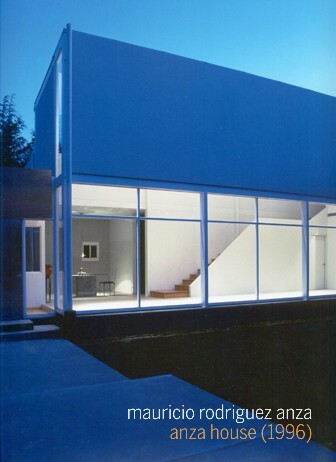 Therefore these amount to nothing but an expression of the architect’s personal taste. After following his work for five years, I am able to say that Mauricio’s career is rooted in solid principles. He had to break ground where an orthodox understanding of national identity almost paralyzed any search into contemporary design and architecture. He has managed to use simple and everyday materials, such as tile and ceramics, industrial grids, and raw finished, making them look elegant. His combination of two extremes, the light weight European design, with its obvious use of junctions, and the heavyweight solid shapes of Pre-Columbian architecture, has not reached the end yet. However this alone has given his work a stature in the realm of contemporary design in Mexico , because of the honesty with which he admits influences in a method search, not in the finished ideas, as these represent only a stage in the whole process. The irony invested by postmodern architects in late times is absent in his work. Mauricio is a serious almost solemn designer. Contrary to the sense of illusion, and the artificial ageing looked for his contemporaries, the designer offers objects that become formal plays with structure and materials in an almost too cold fashion. Mauricio Rodríguez Anza is in the process of creating a style out of repetition, but the innovation looked for almost anywhere is yet to come. Similarities not withstanding, his style is a by-product of a critical attitude toward architecture in general. In his work, as in the case of contemporary architecture, everything is on the making and nothing has been completed so far. “As opposed to my architectural compositions – which are generally based on criteria establishing volumetric confrontations – America is composed of presences. These are suggested in an heterogeneous organization that emerges through relief and the play of light this entails. In this sense the work’s relation to ideas regarding Mesoamerican architecture is hardly gratuitous”. Mauricio Rodríguez Anza in: “Tradizione e tecnologia. Mexican America ”. L’arca No. 93. May 1995. “America” is a symbol encompassing various meanings. Its outer circular forms remind the viewer of the circular observatories built by the Mayans and other ancient civilizations. The layout of the serial elements follows the strict distribution of elements found in the Mayan Puuc Style, known for its sobriety and perfect geometrical patterns. This avoids the use of a long span structure that would have been out of tune with the complex geometries of the site. The whole complex is treated as a penetrable field rather than as a piece of architecture. In its relationship with surrounding architecture, the piece acts as a counterpoint to the orthogonal spaces surrounding it. Its massive volume works as a major introduction to the backbone of the building. In this respect, it also echoes the structure of pre-Columbian pyramids with their circular inner chambers. These historical-environmental connotations, that illustrate the real meaning of the project and set it in its context, provide a framework for the architectural form of the structure, based on scrupulous attention to perceptual and technological considerations, which, however, never distract us from the nature of its surrounding environment. Working on the scale of the outer building, “America” introduces the concept of transition from the outer environment to inner space. This means the designer’s scrutiny must extend all surfaces, an even their reciprocal color relations, in order to maintain their equilibrium with the building itself. Color has played an important role in Mexican architecture. Even now that new materials and structures have emerged, surface color remains a useful tool for concentrating the energy contained in the main structural body. If “ America ” defies description as a building, opening out the fabric of the structure surrounding it, it is largely thanks to a careful worked red hue, highlighted by the palette of blues offered by the building and the sky. 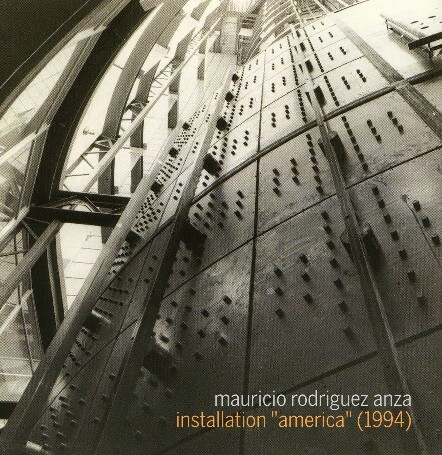 In “America”, Mauricio’s experiment is proof that architecture is not just the superstructure that surrounds us. It is also the feeling of being a body within a larger meaningful body called nature. After his recent “Reconfiguration” study, the author explores new parameters for appreciating and structuring a new plastic in buildings. Plains of permanence analyzes the current proposals of constant motion in Mauricio Rodríguez Anza’s work from their source. This analysis concludes with his first series of buildings of “compact” scale which tend, in the author’s words, to search for purified expression in an evolutionary architecture. A conversation with Chris Larsen. 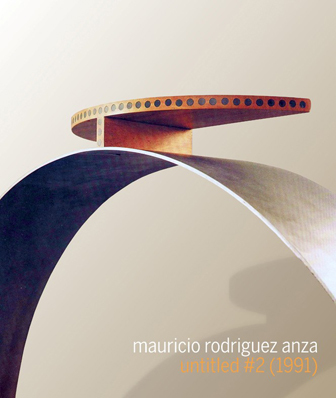 The ‘variants’ of architecture, the reflection they invite and their association with developing new forms of expression have led Mauricio Rodríguez Anza to explore the possibilities of design through objects, installations, furniture, stage sets and other variables in architectural design. It is precisely this syncretism that convinces the author to propose new ways of approaching architectural spaces and bet on a new artform, two themes that are well covered in his recent “Reconfiguration.” In a renewed encounter with his original trade, but under a new code, the author deals with the doubts that architectural expression has posed in recent years. During the conversation, Rodríguez Anza takes us on a brief tour of the process leading up to his present opinion on architecture in motion and about new queries as to the architect’s role. Chris Larsen. You have concluded before that practicing with architectural form has been an act of reaction. Where were you first forced to take that posture? Mauricio Rodríguez Anza. Domo ( Houston , 1985) formally faced the impasses that loomed before conventional architectural design. The chance of cultivating a formal idea from the seeds of discussion was a novelty for me; exposing space to find its components, then treating them as independent prescribed entities. That meant taking a counter-stand to a handling of space and ornamentation which for me had lost any sort of order and logic in the environment I lived in. If eradication was now to be the norm, then it would have to be a version I could feel comfortable with. C.L. Was that the first time you disputed prevailing ideas of regionalism? M.R.A. Yes. I believe that earlier works were hybrid versions of an insistent “new regionalism” which prevailed locally ( Mexico ). A panorama that resulted from an unruly protagonistic struggle. C.L. You have previously said that your non-academic position allows you to freely resort to references. Without really discussing them, which authors impressed you? M.R.A. Diebenkorn, Serra, Brian Clarke, Siqueiros, Donald Judd, Robert Wilson, Alquimia, the futurists, radical designers… some of them for their bold ideas and explorative ability, others for their powers of composition. I could mention others. M.R.A. The rationalists… architects from the Puuc Mayan period. C.L. Was Domo a determining factor that “controlled” your views later? M.R.A. In more than one way. As far as order is concerned, many things became clear to me, while other lasting uncertainties emerged. That was when I began to experiment with transience, seeing a space as specially made for assemblages and a permanent interior motion. This was symbolically connected with the movement of the city I lived in; its momentary financial situation, the product of a temporary crisis, forced changes upon it. Even so, the public it served belonged to a society that was not exactly out for vindication. On the contrary, their dynamism wrought constant renovation. Letting myself be caught up in this idea was most stimulating. Today I think that the renovation concept could mature, even if that sounds paradoxical. C.L. After this experience would you conclude that the treatment of objects could carry the same emotional charge as the treatment of space. M.R.A. As of the third collection (1991). Before that, the design of furniture and objects was as speculative as a therapy for letting off steam. Pieces constantly evoked a deep-rooted bond with the earth. It was also important to observe people’s reaction to a new communication medium. C.L. Hence the exhibitions in galleries? M.R.A. That was a local innovation starting from my first presentation. The intention was to provoke instant reaction to objects less associated with solemnity than others which commonly grace public spaces like painting and sculpture; a dialogue with a different slant from the one that space incites. This continued to be a specialty for people who now design furniture. C.L. What do you find in that third collection? M.R.A. I should mention here that, except for isolated cases, I was never able to reach a public that judged the work the way I expected. That caused my object designs to become more introverted. I had to make great efforts to convert this series into an authored work that in the final analysis was conventional enough to be reused and find a broader scope by returning to the architectural space again. In this collection the ornament is in the end repressed and understood as an idea not to be served but which can be at the service of others. There is also in this series a clear disassociation between the designed object and the immediate impact that work done purely for commercial gain has on the human eye. Design is now a vehicle of ideas as opposed to a blind alley that renders cult to the original intention of ornament. A notion, however, that I believe was to stabilize in later works. C.L. In the period you devoted to museums? C.L. I should now like to talk about your “Four Objects” showing, a series detached from conventional expertise, which opens new forums in museum spaces for this new art. Is this a break with the traditional form-function idea associated with commercial ends, or does that stop with the design itself? M.R.A. “Four Objects” placed me finally in a new posture I find comfortable. Formal language was from here on a tool of communication; I believed that here my questioning of several visibility-clouding fragilities in this profession would be over. “Four Objects” puts into practice ideas about scale and kinetics, the latter as movement encapsuled in a cylinder. M.R.A. That’s how I later came to understand it. Everything is about motion. It was the immobility that first distanced me from architecture. C.L. Before we get on that subject, tell me about your re-encounter with architectural space. M.R.A. It was with Casa Lew. This work reflected the same anxiousness for de-pollution. A space that breathes, while stimulating dialogue: in this case around isolated highly-expressive architectural components. Architecture is a profession of somewhat hazy pretensions, always justified for the service rendered, but always confronted and judged for its artistic qualities. It’s a battle between the two. This project sought identity. Incorporating outside ideas that can be materialized is again more appealing, as in the case of the unbuilt Herradura I and II houses. M.R.A. Among other things. Poetry in architecture has never seemed to me to be an option. C.L. Your experimental work in large formats could be taken as a refusal to take up architecture as a trade again? M.R.A. These jobs are as necessary as it is to constantly reaffirm our convictions. Personally I believe searching rather than contemplating is the best stimulus. Understanding this profession has from the very beginning been a source of great uncertainty, which is why I think it’s been an act of reaction. C.L. More uncertainties than convergences? M.R.A. Yes, but fewer than before. It is clear to me now that architecture must be a balance between search dynamics and collaboration. C.L. What was the objective of the “America” installation? M.R.A. Answers to questions left pending about figuration and the testing of new ideas like ‘immediate space, monumental size and transience,’ although the installation presently exists in its original form, and the intention is to keep it that way. “America” reassures me that mobility can be understood as an attitude by which to design buildings; the alternative work is a non-static position. C.L. Jorge Reynoso Pohlenz says in the presentation of your exhibit “Reconfiguration” that architecture can combine mutability as the norm and not by accident. M.R.A. Precisely. Reynoso Pohlenz was especially involved in the exhibit, not only as curator but, being an unconditional functionalist, as a discussion panelist for these new proposals. C.L. What is “Reconfiguration” aimed at? M.R.A. A personal interpretation of the versatility I think architecture will require in the future, based on new proposals—starting with structural simplification and new expressions. A proposal evolved from practical trials, detached from the current vices that plague architectural composition, such as an insistence on finding parallel meanings in every action. C.L. When did you begin that study? M.R.A. 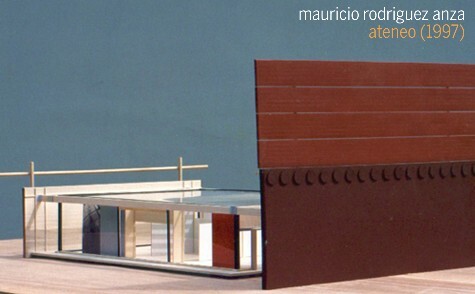 When I was commissioned with the design for the extension building of the Carrillo Gil Museum . The way I saw the project was that endowing it with the right opportunity for evolvement would be most beneficial. The new volume would contain maintainable components or ones that could be replaced by others. The museum’s need for perfect museographic conditions and temperature control were harnessed by a limited budget. My option was to be guided by the orthogonal design of the present museum building and create the look of the new one with panels to give it facades and filter enough light without damaging the exibits. Usage of the building for a time would tell us whether backup or more sophisticated mechanisms should be added and whether the permanent design groundwork for such versatility needed to be laid. M.R.A. A series of projects in that direction. As on previous occasions, only practice can create a structure with ideas and expression. In this case, by imposing new rules for using space. C.L. A new parameter for appraising architecture? C.L. What do you think of the current situation in terms of architectural expression? M.R.A. There are a few grandiose versions of authored work; the rest is mired in a struggle for attention between the wavering new rebel filled with doubts about his creative limitations and the ‘authorized version’ of the group that take shelter under the academic umbrella and who have always battled for star billing as far as art is concerned. C.L. Finally, how would you describe the “Blast” series? M.R.A. Maturity in the ability to reconvert space. This series is uncommitted even to the idea of permanence and uses as a premise independent components in search of new dialogues, both among themselves and in their relationship with their environment. “Blast” reinforces the original Reconfiguration message, the identification of elements in structural composition and their relationship with the flat surfaces of facades. This collection of projects of compact scale have been designed to serve as an introduction to materializing the author’s Reconfiguration theories and at the same time trigger them, in the hope that these theories will freely spread. 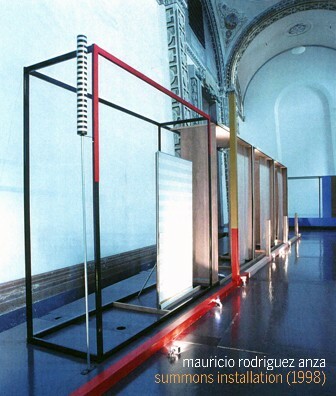 The “Induction Series” combine, on the one hand, Mauricio Rodríguez Anza’s personal theories broadly practiced in diverse disciplines, and on the other hand, his business experience in exhibition spaces as well as architecture and design, from 1984 to 87. Although his involvement with museum and gallery exhibition spaces have defined his present stand on “alternative space,” an earlier period committed him permanently to studying the relationship between space and user. The impossibility of linking time periods with commercial sales became a question as to whether space could allow the user to develop adequately, and whether, in his inability to develop, he was slowed down by a static space that denied him movement. Other questions about conventional space invite reflection such as: providing trial periods, absorbing the cost of “dead periods” by way of temporary periods, marking out areas for dynamic, fast-growing users, relating this interior motion with an art that voices its vitality outside the building, and immersing the author’s work in mundane use, for feedback. A principle to follow in the artistic treatment of these buildings would be the independence of their components for their proper development to the extent that the user requires. The B. Series was designed a mediator between architecture and business, an alternative tool based on the principals of functionalism. Mauricio Rodríguez Anza posee un profundo sentido de exploración hacia la revaluación de la forma en el contexto arquitectónico mexicano. Su revisión sobre la condición de la arquitectura moderna mexicana propone un diálogo entre el espacio exterior e interior. El principal interés de su trabajo reciente consiste en examinar el dibujo en su representación tridimensional, mediante dibujos tectónicos que han ido evolucionando hacia lenguajes específicos con una correspondencia física. Esta dinámica lo ha conducido a la realización de instalaciones que empiezan a tratar con un espacio tridimensional con la intención de desarrollar un nuevo vocabulario para formatos grandes. La deconstrucción arquitectónica que presenta Mauricio Rodríguez Anza en “Summons” consiste en separar los planos arquitectónicos que conforman el aspecto de las sus fachadas ( una articulación estructural que empieza a ser usada como una manera de decodificar la arquitectura de sus arraigadas tradiciones con respecto a iconos que proponen entradas principales, el frente con respecto a la parte posterior, etc., convirtiéndose cada vez en más referencial) en una voluntad de remover las máscaras que han tratado de esconder la materia de la arquitectura moderna, es decir, su estructura. En “Summons” el sistema de formas es sugerido y utilizado de diferentes maneras a partir de un módulo estructural que explora las posibilidades evolutivas que los formatos de composición tienen en relación a la estructura en apoyo a un mejor desenvolvimiento de una edificación. Las diferentes lecturas que propone Rodríguez Anza (armaduras, páneles y apoyos gráficos) son una reflexión sobre las posibilidades protagónicas de sus componentes. Asimismo, la pieza propone elementos identificables para su aplicación en edificios o comunidades integrales. Si el trabajo anterior de Rodríguez Anza hablaba de una arquitectura evolucionable apoyada en la idea de replantear y rejuvenecer los edificios para buscar su mejor desempeño, en “Summons busca además, relacionar un sistema de símbolos arquitectónicos con los movimientos impredecibles de la economía moderna, sujetos a contracciones y expansiones sobre las cuales -dice el autor- no se ha desarrollado una arquitectura adecuada que reaccione de manera paralela. La correspondencia entre el lenguaje arquitectónico y el financiero propicia la evolución de un edificio con respecto a la vitalidad de quien lo ocupa o reutiliza.